Storms made an abject mess of the evening commute Tuesday, as Metro-North suspended all its lines out of Grand Central Terminal, and subway delays and changes caused extreme crowding at some stations. 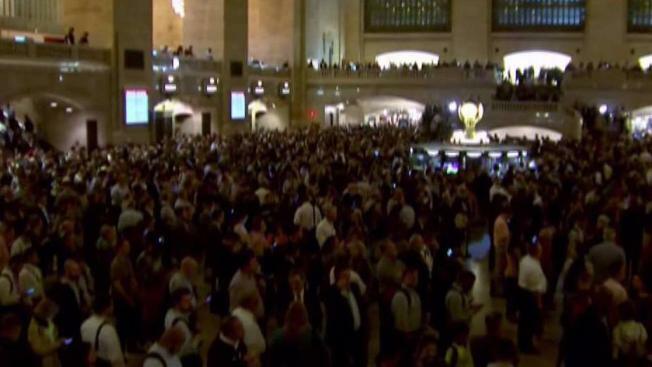 The Metro-North suspended the Hudson, Harlem and New Haven lines entirely "to ensure customer safety during the course of the thunderstorms in our service area" at the height of the evening rush, causing commuter crowds to swell inside Grand Central Terminal. The MTA briefly closed the terminal to ensure crowd safety. By 7 p.m., all three lines were running again, but with significant delays and some portions of the lines still suspended. New York City subways, meanwhile, saw dangerously crowded stations, passageways and walkways, according to people complaining on social media. The 42nd Street passageway between Times Square and Port Authority was especially packed, with people unable to even move on stairs at some points. As of 6 p.m. an Uber ride from Grand Central Terminal to the Ardsley-on-Hudson Metro-North station -- a ride that usually costs as little as $58 -- was up to $237. NJ Transit was also reporting 60-minute delays out of Hoboken due to weather. Check real-time updates right here from the MTA, local airports, NJ Transit, PATH and other sources.